As you know, I have a large selection of travel bags, but it's difficult for me to find one bag that I can use for everything I need, without taking another bag (besides my purse), especially when I travel alone and want it all to fit under the seat in front of me. Walter + Ray had just the carry-on bag I have always been looking for. 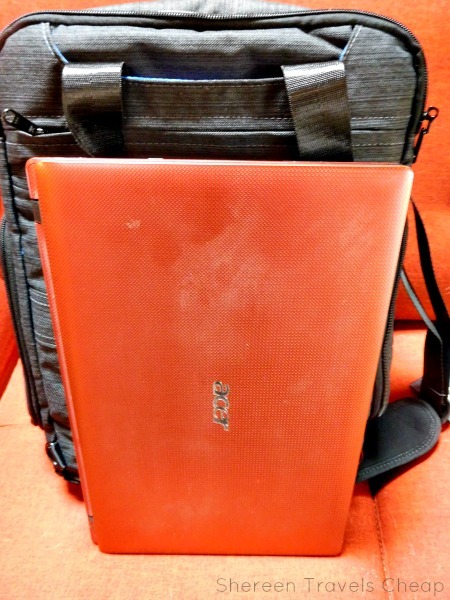 It can be carried 3 different ways and even fits my monster laptop. 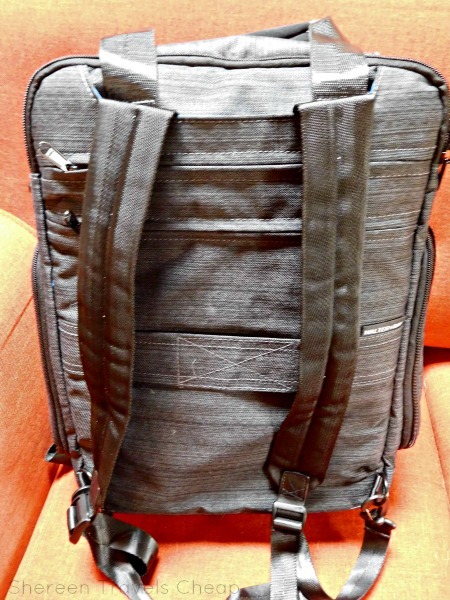 I like the squared structure of the bag and it has over 20 pockets! Everything has a place, in a compact footprint. I decided to pack this bag as I would if I were traveling back to Vegas for work. That front pocket pretty deep. Stash the front handle in there when you're using it as a shoulder bag or backpack, toss everything in your pockets inside for when you're going through security. 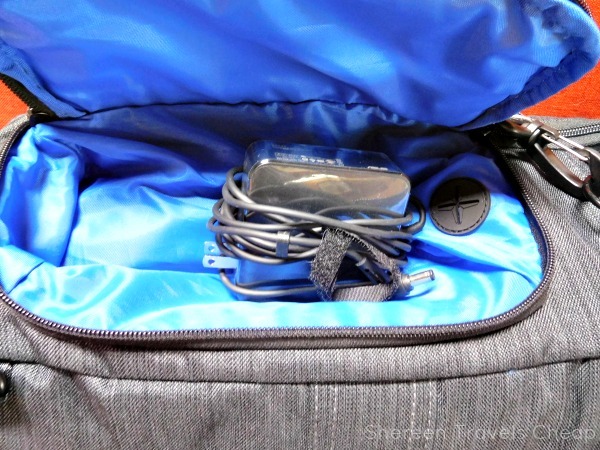 This is also where you might want to put your headphones, as there is a great pass-through from inside the bag where you can keep your phone or iPod. That way you can stay organized and not have your headphone cord all tangled and annoying. 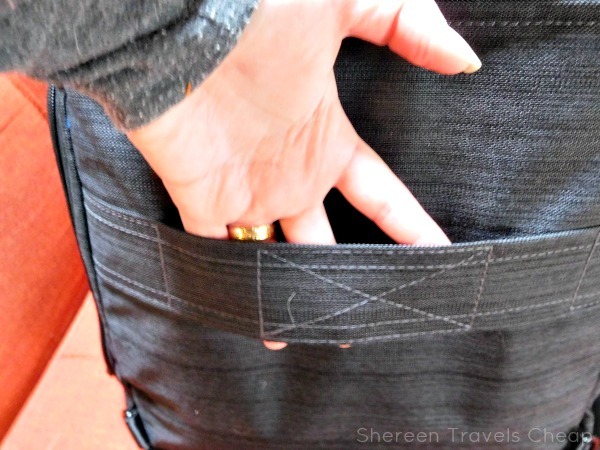 One of the best parts of this front pocket, besides the fact that it stays closed, is the secret pocket inside it. 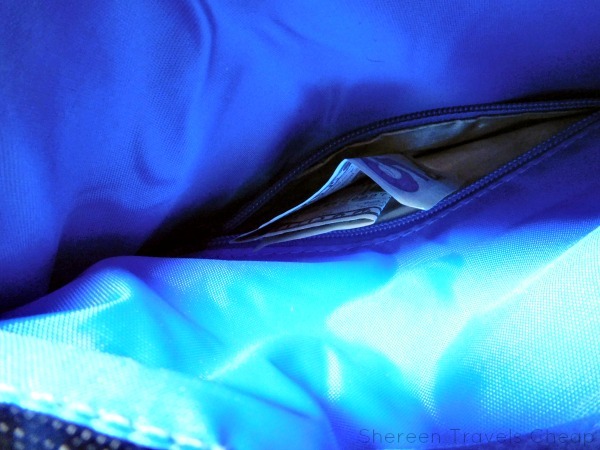 Got money you want to hide away or jewelry you purchased and want to keep safe? This is the place to put it! This pocket is RFID-blocking, too, and where you'll want to keep your passport if you're traveling with it. Flip up the flap on the bag for more pockets. I used the two slip pockets for my ballet flats, but you can also use them for slippers or for one of the padded armrests for your airplane seat that Walter + Ray also sell. These slip pockets are on the front of yet another pocket that unzips. 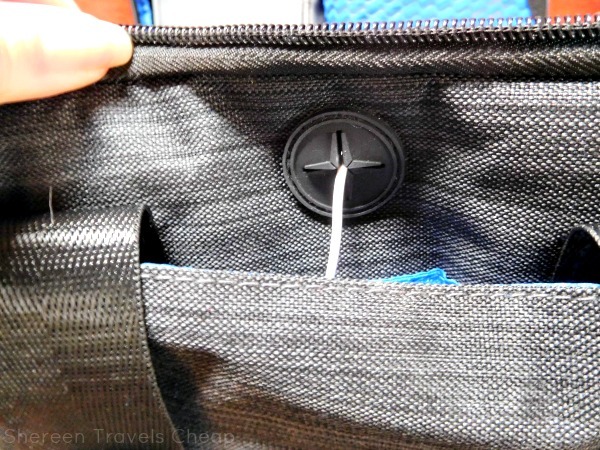 This pocket was designed to fit the TAB backseat organizer (sold separately), but you can use it for anything you want. 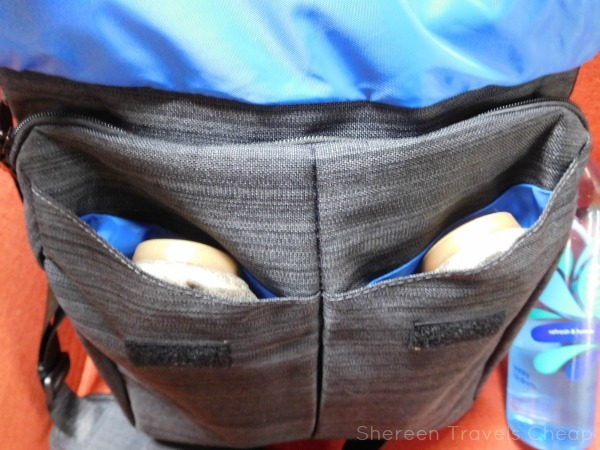 I put snacks in it, though I could have zipped my little purse inside to keep it out of the way during my flight or while walking around the airport. There's also a pocket for your tablet. The laptop sleeve is amazing and fits my 17" laptop in a padded zip pocket. Almost no bag has this feature, and it really helps me get some work done on my trips when I'm able to bring along my computer. For short trips I can get along with something smaller, but it can be a pain. 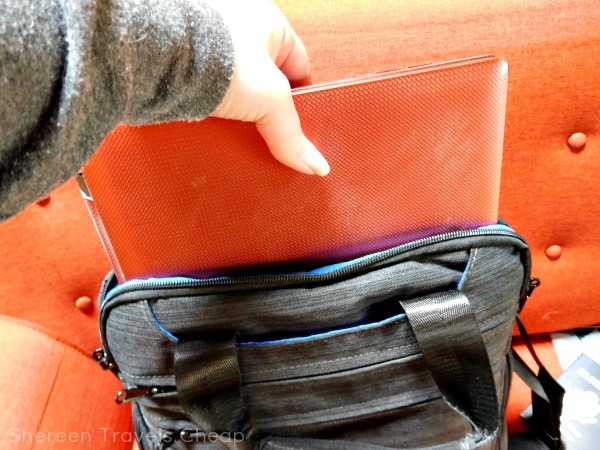 If you have a regular size laptop, it will be no problem keeping it safe in this pocket too. The back of the bag also has threeother pockets. Two zipper pockets that are largeenough to hold a full-size magazine. This is where I also chose to put my envelope that I keep my travel paperwork and my smaller tablet. The top pocket holds your backpack straps and where you can stash that back handle when using the bag another way. 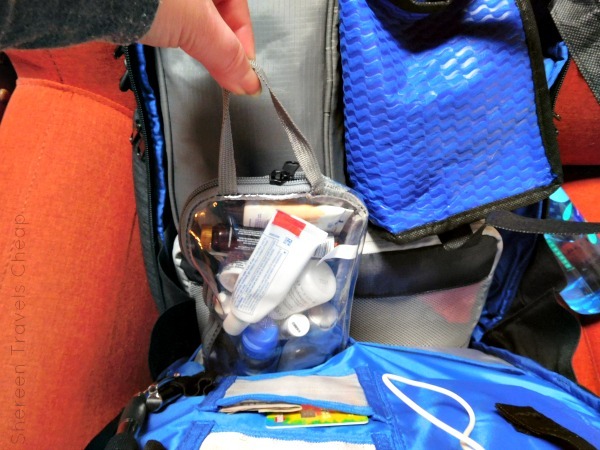 The InTransit bag has that all-important handle pass-through for your wheeled bag, because this will probably be your "personal" size bag or your carry-on for a regular length trip. I pack very small though, because I don't want to carry extra items if I don't have to. When you want to go hands free, the adjustable backpack straps can just be pulled out, clipped on and ready to go. The straps are nice and padded, so they won't be digging into your shoulders and making you hate on life. 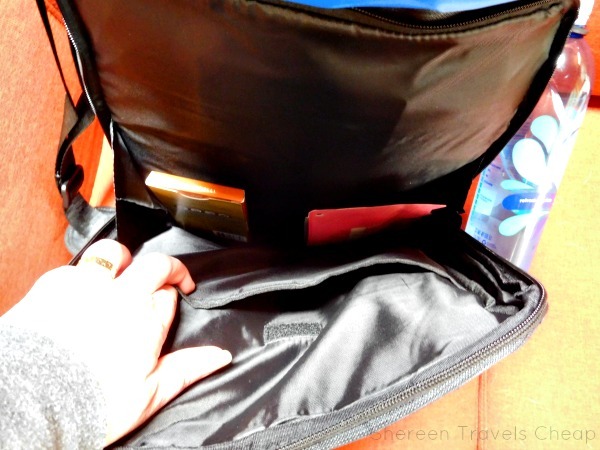 The inside of the bag does all the stuff you want it to and has plenty of room for everything you need to carry. I was able to get a week's worth of clothing inside, plus my toiletry bag and my large travel scarf/blanket. Plus, look at all those pockets on the inside! 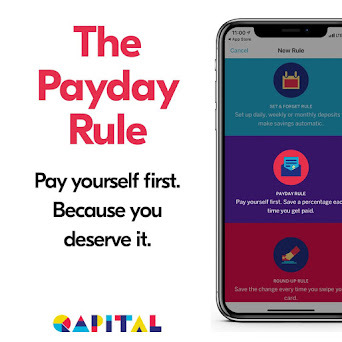 Keep your phone, credit card, ID, pens and more within easy reach. There's even a key strap to wrangle your house keys for when you return home. This bag comes with a TSA-approved 3-1-1 bag, which fit everything from my normal 3-1-1 bag inside, plus fit into its own pocket. Convenient! This handy bag only unzips on 2 sides, so if you have any spillage, it'll stay contained. I also love the handle on the bag. It makes it easy to pull out and even hang up somewhere in the bathroom when you get where you're going. The bag also comes with a lunch bag that keeps stuff cold. It's that little blue bag in the corner. It has it's own pocket as well, when you aren't using it. 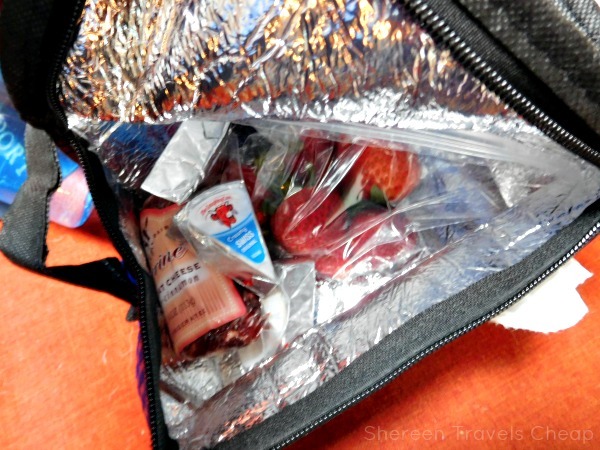 I always want to bring my own snacks on a trip and this little bag is perfect for when I want to bring things that need to be chilled, like fruit and cheese (both excellent choices for a flight). The inside of the bag has a laundry compartment. 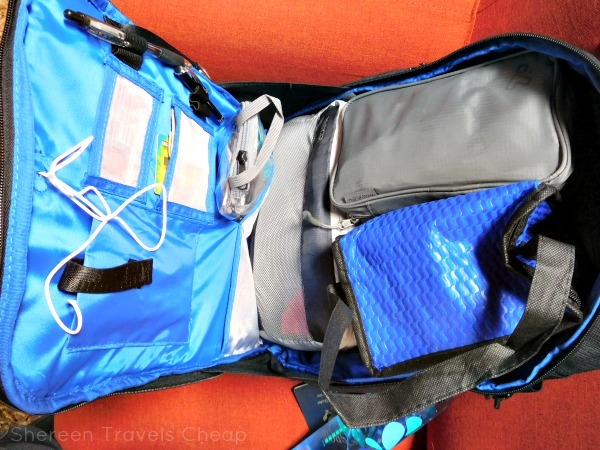 If you're just using this bag as a carry-on, this is where you'll want to stash an extra set of clothes. If you're like me and using this as your main bag, use it for dirty clothes on the way home (or more likely the only clean clothes that are left) or as a space to keep your undies separate. Want to keep your electronics charged on the go? Well, you can! 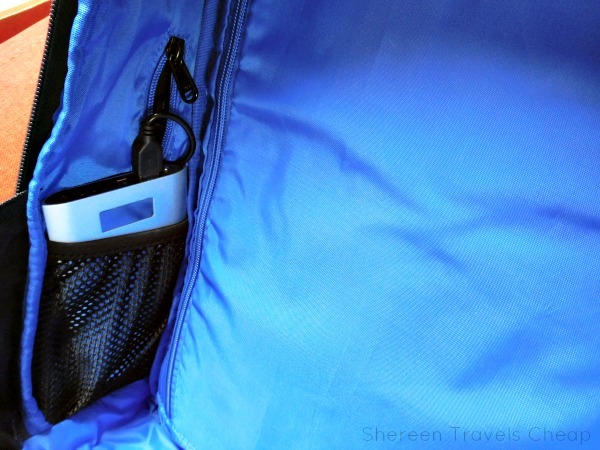 This mesh pocket inside holds your backup battery and has the ability to be plugged into the bag itself. 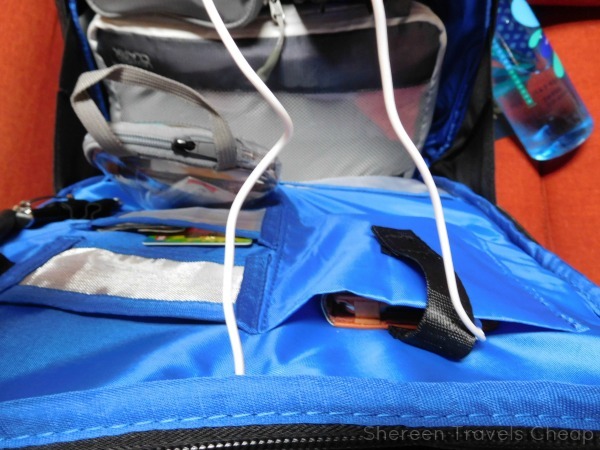 Then, when you need to charge an electronic device, simply unzip the corresponding pocket on the outside of the bag and plug your cord right into the bag. You can either leave it for charging and zip back up or use it while charging with the pocket open. Love it! If you have a wireless charging station, this pocket works for that as well. Charge your laptop and keep the cord out of the way. I hate having to try to find a place to put my stupid big laptop charger. Here I've shown the one that came with my actual computer, but it's way too short for me to sit too far away from a wall outlet. As you can see, this pocket will hold one that's much larger and it even has that cord pass-through. You know why? 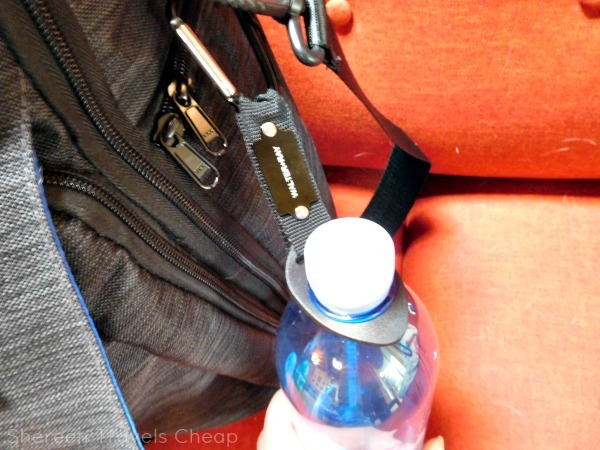 So you can charge your laptop without taking it out of your bag! Aw yeah! Then when you get to where you're going, you know exactly where your charger is and it's not going to get all jumbled in the bottom of your bag (where it always ends up, no matter where you put it). 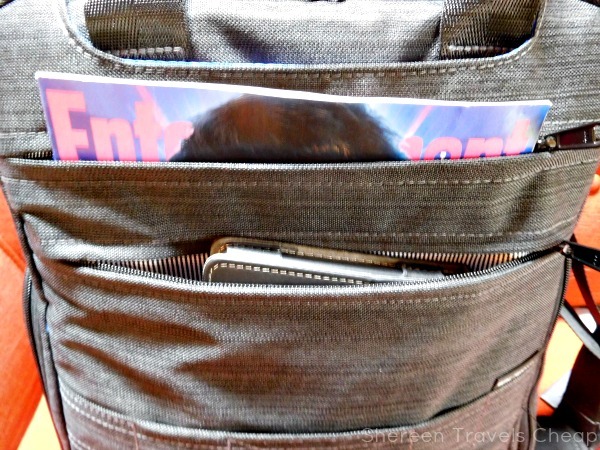 You can also put your shoulder strap in this compartment if you want to use the bag a different way. Stay hydrated! Yes, having a bottle of water on-hand is always important. Walter + Ray knows this and so they added this fancy caribiner clip with a rubber bottle neck holder. Fit it over your bottle's neck and you're ready to go. It fits all standard size tops. 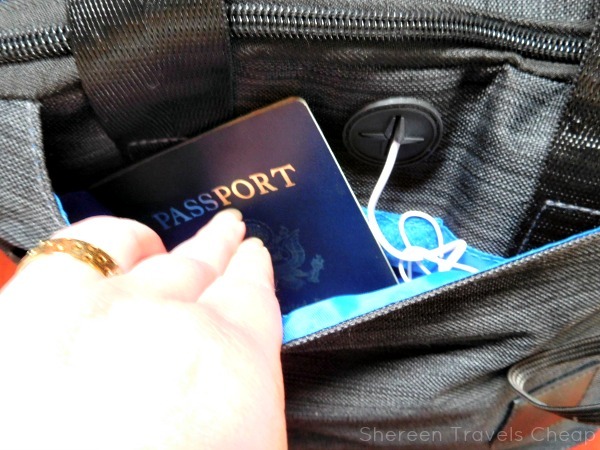 Are you wondering where you can put your boarding pass, besides your pocket? Welp, don't worry, because the front flap has a zipper pocket that fits it perfectly! They've thought of everything! I kind of don't want to unpack the bag for my next trip, and it's in July. 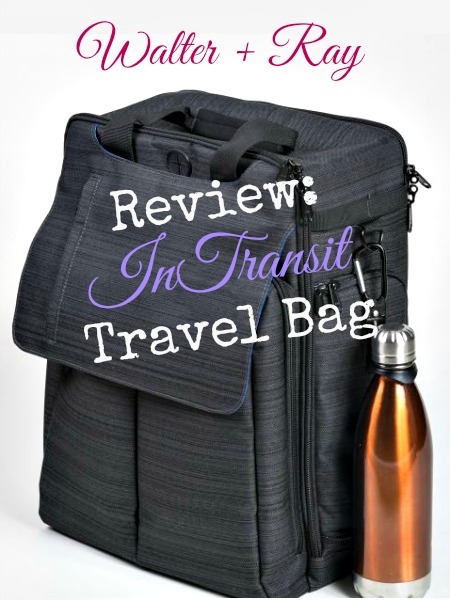 If you use a bag for commuting, the InTransit might be perfect for that as well. It has so many compartments to keep you organized. 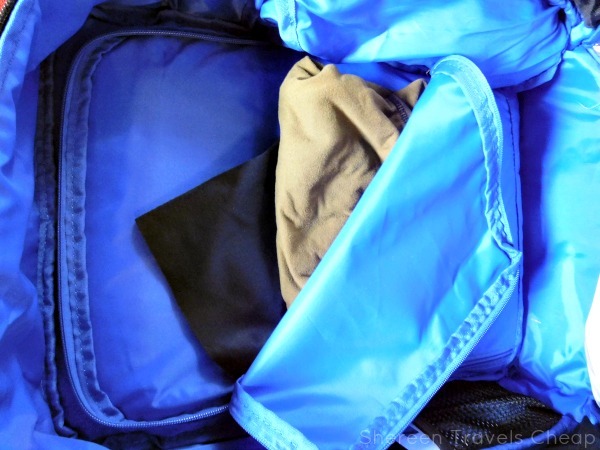 The fabric is lovely for business travel and the size is great for overnights and weekends as well. Other specs: 16″ tall X 12″ wide and 6.5″ deep, lightweight at under 3 pounds, 600 Denier Water Resistant Polyester, Punk Rock Rubberized feet keep your InTransit™ Travel Bag protected when on the ground. Disclaimer: I was provided with the Walter + Ray InTransit Travel Bag for the purposes of this review, but all opinions are 100% my own.